Treat her to a romantic and stylish gift. This gorgeous silver heart shaped pendant is adorned with glistening blue topaz and sparkling diamonds. Perfect for a clean, crisp and contemporary look. 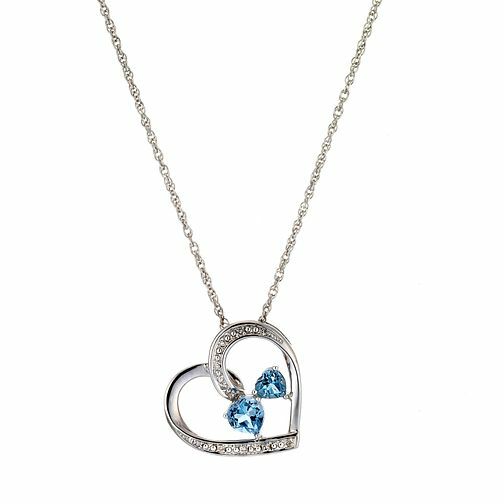 Silver, Diamond and Blue Topaz Heart Pendant is rated 4.4 out of 5 by 18. Rated 4 out of 5 by Anonymous from Good purchase girlfriend loves it. The chain is a little longer than expected but still worth it. Rated 4 out of 5 by Anonymous from Great necklace and great price I bought this for my wife for Christmas and she loves it. My biggest fault was paying to have a message sent with the neckless, it was a lovely message which I thought would of been put on a card etc yet it was put on the bottom of an a4 printed receipt, which you wouldn't want to put with a gift. That side of it I was very disappointed with.